Traditional Zimbabwean-style pieces as well as brand new originals for marimba ensemble. Interested in giving back to the community? Then buy this CD. It's a win-win situation: You won't be disappointed, and 100% of your purchase will directly support one of the most innovative music education programs in the state of Oregon. It's a small cost with some big results. This debut album by Portland, Oregon’s Binnsmead Marimba combinines the intricacies of traditional Zimbabwean music with original compositions influenced by jazz, latin and classical music. "A Shadow’s Reflection" is a one-of-a-kind display of musicianship, community collaboration, and superior artistic product. "A Shadow’s Reflection" features something for everyone, with traditional favorites like "Ekwanongoma" and "Skokiana" to move your feet. "Ride on the Reading," an original composition based on a theme by JS Bach, is brisk and cheerful, while modal works like "Zomba" and "Azure Gold" are evocative and contemplative. 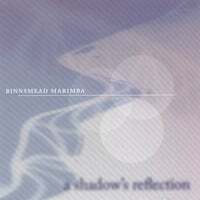 The album’s finale, Binnsmead Marimba’s own rendition of the United States’ "National Anthem," is a virtuosic display for the lead marimba; it shines over a non-western treatment of rhythm in the band, which takes full advantage of the instrument’s diatonic scale and percussive nature. Surprisingly, the artists on this album range only from 11-15 years old, as students at Binnsmead Middle School in outer-southeast Portland. Binnsmead hosts this after-school performance program, which maintains two bands: one for advanced students, and one for intermediate students (tracks 3, 6, 8 and 12 only). In spite of its educational nature, however, "A Shadow’s Reflection" is a well-executed, respectable endeavor to earn a place among Portland’s premier marimba bands. The album’s high-caliber presentation and uncompromised artistry is due to the fact that Binnsmead Marimba places a special emphasis on performance and professionalism. Frequently sought-after as a performing ensemble, Binnsmead Marimba has appeared at the Wonder Ballroom, the Crystal Ballroom, the Rose Garden Arena, as well as numerous community events and art openings. In the 2005-2006 academic year alone, the students in Binnsmead Marimba were able to reach over 16,000 members of their community through live performance. "A Shadow’s Reflection" was made possible by a grant from the Regional Arts & Culture Council. All proceeds from CD sales go directly toward funding this valuable educational experience for future Binnsmead Marimba groups. To find out more about our school, our students, and what makes Binnsmead Marimba so special, and for a calendar of events, sound clips and a photo gallery, visit www.binnsmeadmarimba.org. I am one of two teachers of the marimba belles. We'dike to venture into the sounds you're getting. The recording is clean, clear, and full of fun.So, Hey, you're getting an outside review. Sounds refreshing. Regards, Graham. Im one of those players!! so hope you love it! having spent hours in the recording studio making this cd i personally still love it. all tracks i listen to regulary on my mp3. the music calms you... and you get lost in it. the thing that seems to make it so beautiful and popular among those who know it is the fact that this kind of music is so unique and rare. family, friends, teachers all have the cds. who said kids cant do what adults do? I playy in the marimba band.Its so awsome. I love to play in the band.The music is very soothing and sometimes very exciting I love to listen to it and play in the band!! Well, the summary up there says it all. I've played in the band, hell, Buya iAfrica, I played the first instrument you hear. But enought about that. It's soothing, but... You shouldn't get too comfortable. It's very upbeat, meaning that the lead part, sometimes hits that high note, if you know what I mean. It's been a long time since I've played. I was one of the students that helped create this CD (so long ago!). I actually came up with the name. This brings back wonderful memories. Not only that, the music is great. I still listen to it, and it really puts me in a great mood. I love this cd! The music is so energetic and delightful and fluid...it reminds me of rain--not dark, gloomy depressing rain, but a cheerful rain falling on a sunny day. When I first got it, I listened to it straight through about 10 times in a row. A perfect cd for brightening up unpleasant tasks (housecleaning comes to mind) or setting a cheerful tone for dinner parties, A Shadow's Reflection is one of my favorites. The fact that Binnsmead Marimba provides wonderful opportunities for kids makes it an even more worthwhile purchase...although honestly, the wonderful compositions and talent of the Binnsmead Marimba students is reason enough. Highly recommended!